In 1743, Lord Falmouth contributed £500 towards the erection of a workhouse on St Clement's Street for St Mary's parish. A parliamentary report of 1777 recorded that Truro's workhouse could house up to 56 inmates. The building proved inadequate, however, and in 1779 the city corporation granted St Mary's a 500-year lease on Hospital Meadow (near where Pydar Street now stands), at an annual rent of one pound, on which to build a new workhouse for eighty inmates. In April 1781, the parish vestry appointed William Brewer and his son, also named William, 'to superintend and manage the workhouse and to employ the poor placed therein'. 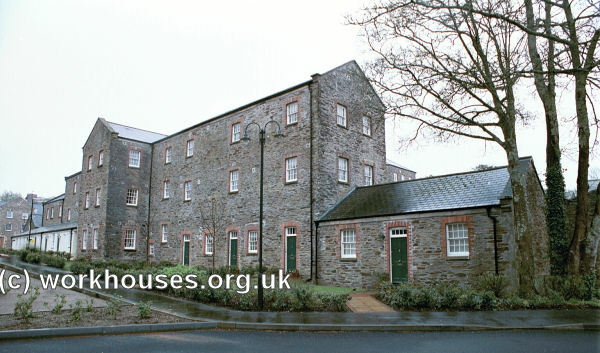 The St Mary's workhouse was also used by the parish of St Clement's. However, in 1829 St Clement's built a new workhouse for 150 inmates at the top of St Clement's Hill. From 1893 to 1925, the premises housed the Truro Isolation hospital. 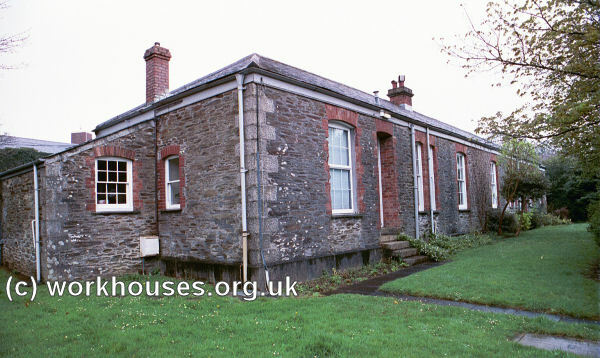 Kenwyn's parish workhouse stood in Kenwyn Street. In 1777, it could house 50 inmates. In 1829, its governor received a slary of £50 a year plus a house, coal, and candles. St Agnes had a poorhouse up until 1818 but it was then discontinued. Cornwall: Cornelly; Cuby; Feock; Gerrans; Kea (4); Kenwyn (6); Lamorran; Ladock; Merther; Perranzabuloe (3); Philleigh; Probus (2); Ruan Lanyhorne; St Agnes (5); St Allen; St Anthony in (Roseland); St Clements (3); St Erme; St Just (in Roseland) (2); St Mary, Truro (3); St Michael Penkevil; Tregavethan; Tregony; Veryan (2). The population falling within the Union at the 1831 census had been 39,114 — ranging from Tregavethan (population 59) to Kenwyn (8,492) and St Mary, Truro (2,925). The average annual poor-rate expenditure for the period 1834-36 had been £11,369 or 7s.10d. per head of the population. 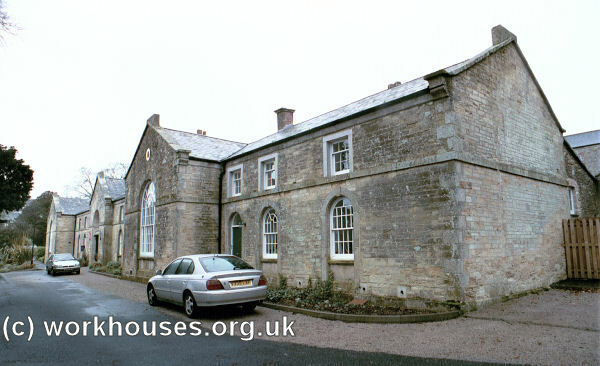 Initially, the new union made use of existing parish workhouse premises at St Mary (for 75 inmates), St Clement (148 inmates), and Probus (108 inmates). The building was designed by William Harris and broadly followed the popular cruciform plan. At the south lay a low two-storey front block with a central entrance archway. Truro entrance block from the south-west, 2001. To the rear was the main H-shaped accommodation block comprising a four-storey central hub from which emanated three-storey accommodation wings for the various classes of inmate. 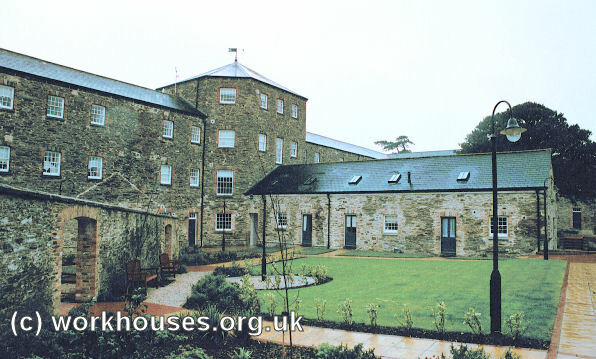 Truro main block from the south-west, 2001. Truro main block from the north-east, 2001. An infirmary block stood at the north side of the main building. One side of the building was for male patients, the other for females. Truro infirmary block from the north-west, 2001. An isolation block stood at the north of the site. Truro isolation block from the west, 2001. In 1894, the British Medical Journal set up a "commission" to investigate conditions in provincial workhouses and their infirmaries. Following a visit to Truro, the commissioner's report found much to criticise about the workhouse infirmary. The buidling was said to be very unsuitable for infirmary work, with its small wards, many staircases, and rough walls which were hard to keep clean. There was a lack of bathrooms and no piped hot water — the only supply was from a copper in the infirmary laundry, out of which the hot water had to be baled when required. Only one nurse was employed to look after the infirmary's 78 beds, assisted by paupers — usually of great age or "bad character". There was no night nurse employed. Further details are available in the full report. 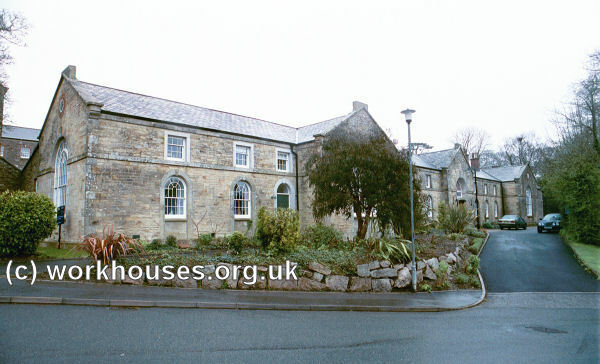 During the First World War, Truro workhouse was converted for use as the 210-bed Truro Auxiliary Naval Hospital. It opened in November 1915 and closed in March 1919 after treating 4000 patients. 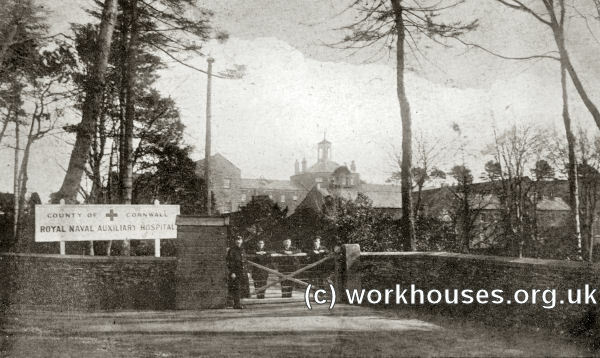 Truro Workhouse as Royal Naval Auxiliary Hospital, c.1916. 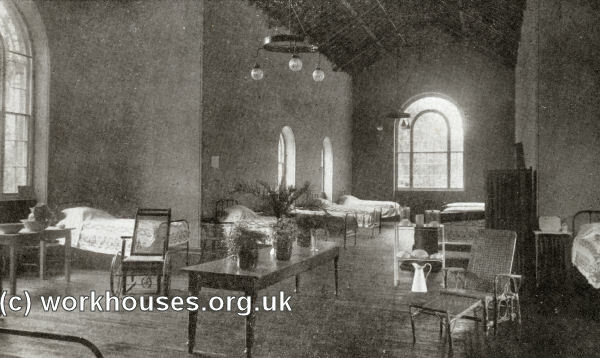 Truro Workhouse as Royal Naval Auxiliary Hospital - Chellew Ward, c.1916. The workhouse later became St Clement's Hospital but has now been redeveloped for residential use. Cornwall Record Office, Old County Hall, Truro, Cornwall, TR1 3AY. Few records survive — holdings include Guardians' minute books (1857-1930); Ledgers (1857-66, 1875-1914, 1916-28); etc. Euden, Lin (2017) The House on Union Hill: The Story of the Truro Union Workhouse . (ISBN 978-1-5262-0551-3. 125 pages. £9.99. Copies available from Crescent Book Publishing, Trepolpen, The Crescent, Truro TR1 3ES. Alternatively, email peuden@btinternet.com). The union's early correspondence with the central poor-law authorities is online on the TNA website .